According to the CNNSi Wikipedia page, “CNN Sports Illustrated (CNNSI) was a 24-hour sports news channel. It was created by Time Warner, bringing together its CNN and Sports Illustrated brands and related resources.” CNNSi.com was the domain name that was used for the channel’s website. I was looking at NameJet this morning, and I saw that CNNSi.com was in pending delete status. CNNSi.com currently has a $901 high bid at NameJet with 64 backorders. CNNSi.com is currently registered at CSC Corporate Domains. Prior to the domain name entering its pending delete status, it was registered to Turner Broadcasting System, Inc., parent company of CNN. I am surprised this domain name dropped given its history and value. Obviously a 4 or 5 figure sale wouldn’t mean very much to the former owner’s bottom line, but it’s still money that is going to be lost. That said, there may have been issues around selling or using the domain name since it contains two trademarks – CNN and SI (for Sports Illustrated). I am also surprised that they companies didn’t have some sort of deal in place for one of the companies to continue using the domain name, presuming it didn’t accidentally drop due to a forgotten renewal. With the trademarks associated with this domain name, I will not be an active particpant in the CNNSi.com auction. I backordered it at NameJet to follow the auction, and I will try to provide an update once the new owner has the domain name. Update: CNNSi.com was sold at auction. The apparent Alexa rank alone will jack the price up, but the fact is the 79 Alexa rank for “cnnsi.com” is coming from CNN.com. SI.com holds the same rank as CNN, but why that is I’m not sure. Worthless? Lol check out its backlink profile. Who is linking to it? Anyone? 100K backlinks across 6700 unique domains. Pretty solid for a SEO domain. Really? And did you do a link search and discover a grand total of “0” links to this domain? I did. I can’t imagine there are 0 links. In fact, I am quite sure there are thousands, simply because of its popularity in the 2000s. I did a Google link search for both www. and non-www. Both came up with no links at all, that’s all I know. Whatever this backlink profile is that Brad referred to, it would seem to me that 0 links on a Google link search would have to mean something. I’m all ears and open-minded to be convinced, as I imagine other folks here know more about other link search resources that I haven’t bothered with or am not aware of right now. Here are 4. Wikidpedia alone has 62 separate pages that link to cnnsi.com and they are very authoritative in Google’s eyes. I just verified on ahrefs.com that cnnsi.com has approximately 87,000 backlinks coming from over 5,000 domains. 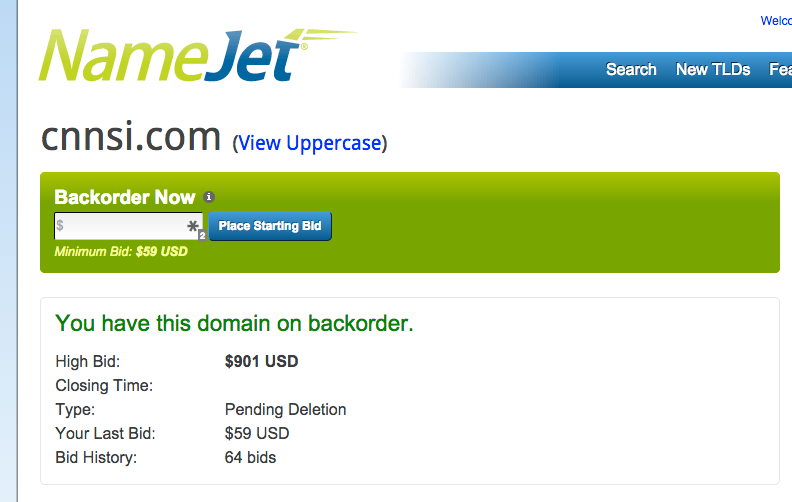 This is one very valuable domain. Okay, then why does a Google link search yield none? I can’t answer that, but I think you can confirm that there are links to it based on the links that were provided. Then why does a Google link search yield none? This is not a “teach me seo” thread. It’s obvious and been proven there are links to it. Time for this to be over. So who’s going after oero.com which is about to drop, by the way?